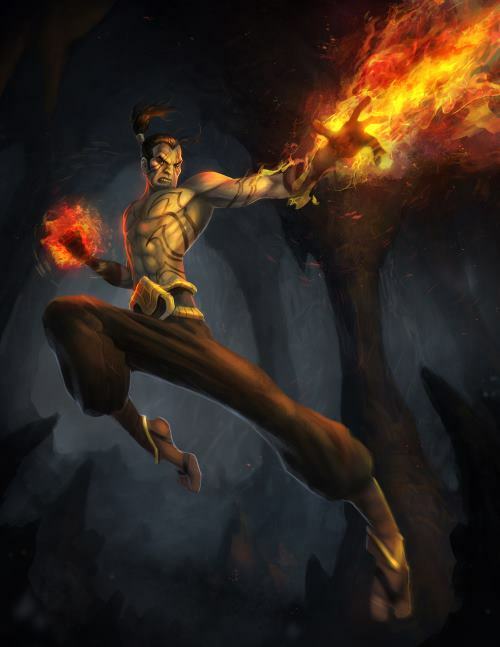 The skills of the monk forge mind, body, and spirit into an indomitable force. Using their unarmed attacks they can break limbs, cause internal bleeding, sweep an opponent off his feet, and deliver body-crushing throws. 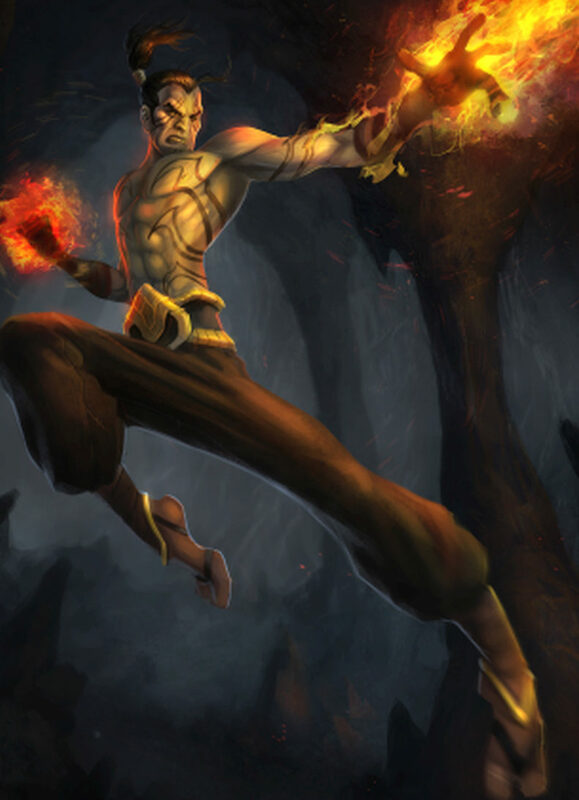 A monk can confuse and damage the mind even over a distance and through the power of kai, can toughen his body to withstand damage, make himself heavier, and restore damaged limbs by sheer force of will. What little is known about the origins of the monk class is that an ancient order of monks called the Sentaari developed the ability to use telepathy and harness kai energy. They also mastered the art of edgeless weapons, including the staff and the cane. These weapons allowed them to defend themselves against attackers without killing them, but were stripped from the monks in order to prevent them uprising in defense of an ancient Empire. When their aid was eventually needed the Sentaari's Grandmaster of Flowers meditated for a month, then unveiled the unarmed art of Tekura, vowing that the monks would never again be made helpless against evil. Combining Tekura with his pre-existing mastery of Kaido and Telepathy, the Grandmaster drove the attackers from the monastery on Judgement Mountain. After the war, he disseminated the art to all the other monasteries, and so it has remained. The art of Tekura was first developed more than 600 years ago, long before the fall of the Selucarian Empire. A sect of monks was being persecuted by some of the legions of the Empire and the monks were not permitted weapons to defend themselves. So, they were forced to train their bodies to martial perfection; their hands and feet becoming deadly weapons in and of themselves. Most of the tekura abilities are affected by a variety of factors. First, being in a stance modifies the damage and speed of each tekura attack. You will always want to be in some stance or another while using tekura. Second, the higher your tekura, the more likely you are to hit an opponent with a particular attack, and the more damage you will do with that attack. Horse The most basic stance. Eagle Stance of the soaring eagle. Sidekick A powerful thrusting kick. Uppercut An upwards hooking punch. Bodyblock Using your body to block blows. Palmstrike A strike with your palm to the face. Hammerfist A strike with your fists to the legs. Cat An agile, defensive stance. Evade A block that attempts to completely avoid attacks. Sweep Attempting to sweep your opponent off his feet. Bear A highly specialised stance. Slam A throw to target the head. Moonkick A powerful, curving kick. Spear A jabbing punch with an outstretched hand. Thrustkick A kick designed to push your target away. Wrench A throw that targets already damaged limbs. Axe A slow but powerful kick. Guarding Guarding a body part and counterattacking. Scorpion A devastatingly powerful attack stance. Whirlwind The most powerful kick. Bladehand A swift strike to the side of the neck. Pinch A special and powerful block. Jumpkick Attack someone in an adjacent room with a flying kick. Dragon The superior state of mind. Kaido is a skill with two main parts to it. The first part, comprising the lower abilities, consist of an assortment of defensive abilities that rely on bodily control, such as automatic mana regeneration and healing your limbs by force of will. The higher abilities relate to the use of Kai energy. After you have built up Kai energy by being near violent actions, you may use the Kai abilities, which are extremely powerful. Vitality Call upon a rush of adrenaline to heal you. Toughness Increased resistance to physical attacks. Deaf Blocking out sound by force of will. Regeneration Regain health through strength of mind. Blind Blinding yourself to prevent optical damage. Nightsight Gain the ability of infravision. Restoration Healing damaged limbs by force of will. Splitting Constant meditation by splitting your consciousness. Consciousness The ability to stay conscious at all times. Immunity Immunity from most poisons. Boosting Increasing your rate of regeneration. Transmute Instantly convert mana into health. Numbness Delaying the effects of damage. Kaitrance Entering the mystical Kai Trance. Kaichoke Crush a victim's windpipe remotely. Kaicripple Cripple your target completely. Kaiheal Healing yourself with Kai energy. Transition Push yourself beyond your limits. Surge A blast of focussed power. Kaiboost Increase your receptiveness to Kai energy. Enfeeble Unleash a massive blast of kai energy at your opponent. Deliverance Grant your enemies release from this mortal coil. Telepathy is the formidable skill of mental manipulation. Whether you want to locate a friend, or eavesdrop on a foe's every move and word, telepathy enables utility, defence, strategy, and offence. With Radiance the adept can even destroy the mind of another, ending their unfortunate life in a blaze of power. Telesense Detect attempts to mind lock you or others nearby. Fear Fill your target's mind with an irrational fear. Hallucinate Project an illusion into the mind of your subject. Confuse Disrupt and confuse your subject. Drain Draw mana from your subject's mind into your own. Divine Determine the health and mana levels of your subject. Stupidity Induce idiocy in the mind of your opponent. Paralyse Exert mental power to paralyse your subject. Amnesia Induce temporary forgetfulness into your subject. Deadening Dull your opponent's mind. Crush Attack your subject with a crushing psychic attack. Strip Strip the defences from your opponent. Scythe Cleave their psyche asunder. Batter Devastate your opponent's mind with an overwhelming attack.